1:The USB charger should be charged with a current output less than 1A. Using quick charger higher than 1A is not allowed. 2:Do not charge the battery immediately after operating the drone. Please make sure it is cooled down to avoid overheating. 3:Please learn the "Emergency landing function" before flying the drone to advoid lost the drone. 4:If the drone blades spin but fail to take off, it just keep spinning around or tips forward, it is due to the wrong side installation of blades.Every blades has indicated alphabet A and B. Please install in correspondence with blade A and blade B. Otherwise the drone will fail to take off. Drone Dimensions: 4.7x4.7x2.6 in./12x12x6.5 CM. Charging time: about 60 mins. 1 x HASAKEE H1 Drone with WiFi FPV Camera. 1 x 4-channel, 2.4GHz Transmitter with Phone Holder. 1 x 3.7V 450mAh Li-Po Batteries. 4 x Spare Replacement Blades. 2)If it's your first time flying make sure you practice in a field far away from people, cars, trees and other obstacles. 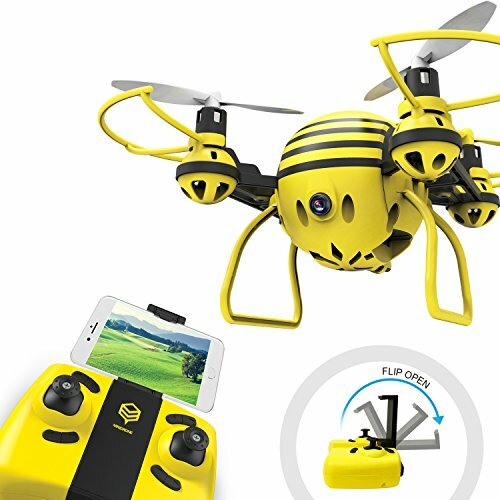 Yellow bee：2.4GHz Technology and 6 axis stabilization system for smooth flight,easy to control. Good For Beginners,Kids,Drone traniners. One-Button 360° Flip and One-Button Take off/Landing：easy to set up and control. One-Button Speeds Switch(High/Medium/low)：Low speed for beginner, high for skilled aviator. Make your flight easier and safer. If you have any questions about this product by HASAKEE, contact us by completing and submitting the form below. If you are looking for a specif part number, please include it with your message.